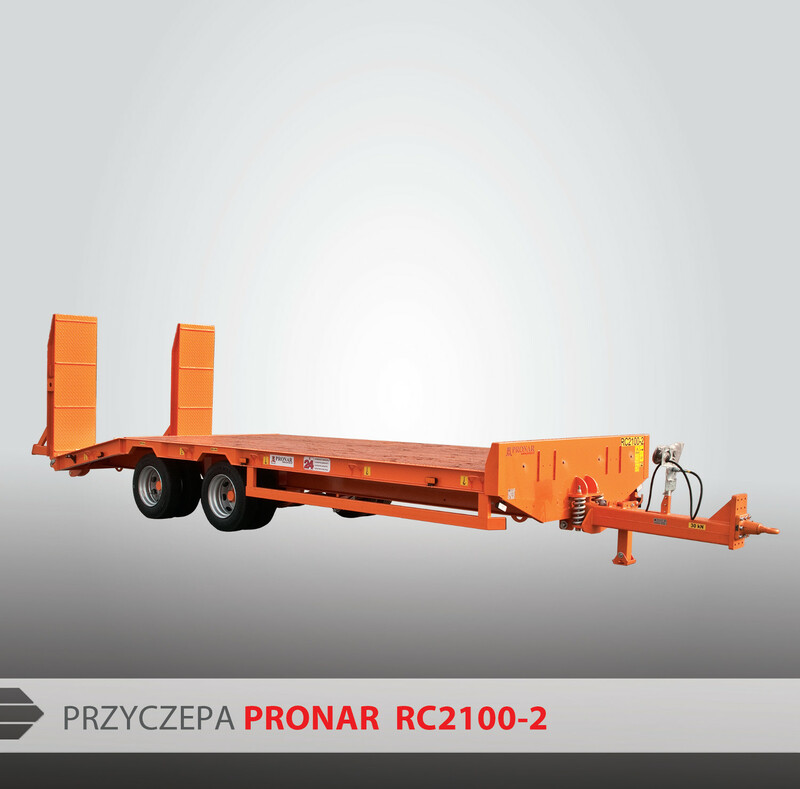 PRONAR trailer RC2100/2 - Pronar Sp. z o.o. PRONAR trailer RC2100/2 is a perfect solution choice for those who appreciate functionality and reliability. Low bed trailer with permissible total weight 19 tons and it’s equipped with tandem suspension. This trailer is equipped with single line hydraulic brake system. This new model is lighter and cheaper version of popular trailer PRONAR RC2100. The main purpose of PRONAR RC2100/2 is to use it for transport various types of agricultural machinery, tractors, excavators, wheel loaders or other type of trailers. It’s possible to order hydraulic ramps which allows for very fast loading and unloading of transported machines. In addition, you may choose also a metal insole which makes that the whole floor is flat. Support legs are welded to folded ramps and they ensure safety of loading even without connection to the tractor. Mechanical and foldable support of the drawbar. Frame made of double T-section profiles and with densely arranged transverse beams allows to transport heavy cargos with speed 40 km/h. Short distance between platform and the ground. Double-component chemically hardened painting materials, UV-resistant.